Chromium is what is known as an essential trace mineral. It is essential because it is involved in the critical metabolism of macromolecules and is involved in insulin signaling pathways. The picolinate portion is what Chromium is bound to and is it the picolinate portion that gives the Chromium some special properties, especially when compared to dietary chromium. Picolinic acid helps to make the Chromium portion of the supplement more stable and it acts to increase its bioavailability (meaning the amount that your body can use). Chromium bound to picolinic acid (picolinate) helps to increase the absorption and, therefore, the utility of chromium. Because of this we actually don't have any way to accurately determine if someone is deficient in Chromium (1). The reason for this has to do with how little we understand the complex role of Chromium in the body. We have isolated out certain ways that chromium helps by reverse engineering studies and by looking at obviously deficient patients, but there still isn't a good way to determine if patients are suffering from minor deficiencies or sub-optimal levels. We know that rats fed a diet depleted in Chromium present with dysregulated blood sugar and insulin signaling and we also know that patients with type II diabetes have 20-40% lower blood chromium levels and 40-50% chromium levels measured in scalp hair when compared to healthy adults and controls (2). Obviously, this promotes a challenge when we discuss the importance of Chromium and when we talk about supplementation! So with that in mind, we really need to discuss how or why people would be deficient in Chromium, to begin with. #1. Many people may simply not be eating enough. Studies have shown that absorption of Chromium only occurs when chromium is bound to specific organic molecules which are created by various yeasts and the kidneys (3). It may be possible that people are consuming foods that are replete in Chromium but because of the binding of chromium to certain molecules (or lack thereof), it isn't being absorbed. #2. You may actually be losing too much in your urine. Another big problem is that certain conditions increase the amount of Chromium that you lose in your urine. Conditions such as stress, pregnancy, infections and diet high in sugar have all been shown to do this. So for many patients deficiency is likely a combination of both factors. The primary source of dietary chromium is from yeast, meats, and wheat germ. You also get trace amounts of Chromium by using or cooking with stainless steel. You can consider this list of diseases and conditions as potential risk factors for developing chromium deficiency, but they don't automatically mean that you are deficient. We'll talk more about supplementation below, but for now, just realize that certain states promote a scenario in which deficiency is likely. Can you get enough Chromium from diet alone? We know that Chromium bound to picolinic acid is incredibly stable and actually is absorbed and utilized by a different mechanism than food sources of Chromium (4). Chromium picolinate is strong enough to withstand the acidity of the stomach and it is rapidly absorbed in the small intestines which is why this particular supplement has gained popularity. In this way, it may actually be superior to natural food sources and for those who consume a diet depleted in Chromium. But there are also potential disadvantages to using supplemental Chromium over food sources. Studies have shown that in order for Chromium bound to picolinate it may be necessary to form a hydroxyl free radical (5) which may ultimately result in DNA damage if used long term. It seems that his potential negative side effects can be mitigated by simply using Chromium for a short period of time. Now that we understand a little bit more about Chromium we can talk about the potential benefits of using this trace mineral. Long before Chromium was created as a dietary supplement, scientists knew from animal studies that it was very important. Only recently have more studies been done in Humans to help grow our understanding. These studies helped us to understand how Chromium works from its effects on cholesterol and insulin to how it helps regulate insulin resistance. We've also uncovered other potential benefits such as Chromium supplementation in the setting of atypical depression and cognitive impairment. While these benefits are impressive it's important to only use supplements if you suspect (or know) that you are likely to have a deficiency. Because we don't have a great way to assess from Chromium deficiency it may be necessary to use certain clinical symptoms as early indicators. You can use this list of potential side effects of Chromium deficiency to help you figure out if supplementation is a good idea in your specific case. With that in mind let's discuss the potential beneficial side effects of using Chromium in those people who are likely deficient. Daily supplementation with Chromium has been shown to significantly (statistically speaking) reduce total cholesterol, LDL levels, and apolipoprotein B when compared to placebo. This is important because we know that dysregulated Cholesterol may result in an increased incidence of cardiovascular accidents such as heart attacks. So how does Chromium help improve cholesterol markers? The first is likely mediated through its effects on insulin signaling. Insulin resistance is a known cause of dyslipidemia and one of the diagnostic criteria for metabolic syndrome. The idea is that as you increase insulin sensitivity you will likely solve a number of problems ranging from hypertension to cholesterol levels. In this way, chromium is probably helpful. The second way is through its effects on lipid and carbohydrate metabolism. It may be that chromium supplementation helps your body metabolize these fats which may result in decreased circulating levels of cholesterol. One of the most well-known benefits of using Chromium has to do with its involvement in insulin signaling. Insulin is a very important hormone that helps regulate blood sugar in your body and cells. Insulin dysregulation (also known as insulin resistance) is implicated in the pathogenesis of type II diabetes, hypertension, weight gain, and high cholesterol (6). I've also previously stated other studies have shown that patients with type II diabetes have 20-40% lower chromium blood levels when compared to healthy people. It has been theorized that Chromium may be involved in the development of type II diabetes in some individuals. It's also possible that type II diabetes may result in physiologic changes which result in chromium deficiency. Either way, it's been a topic that has been researched in depth recently. People want to know if taking Chromium will help reduce their risk of developing type II diabetes and if it will help those lower their blood sugar if they already have type II diabetes (or even pre-diabetes). The answer is yes, but the amount that it helps varies from person to person. A review of 15 trials using chromium picolinate shows that this mineral does indeed help reduce glucose levels (7). These studies show that taking Chromium may help lower the Hgb A1c by as much as 0.95% (or almost 1%). This may not seem like a high number but if you consider that Diabetes the difference between pre-diabetes (5.7%) and diabetes (6.5%) this supplement alone may be enough to normalize glucose levels in some individuals. The bottom line for patients is that chromium supplementation may be worthwhile as an extra therapy to existing medications or as a natural approach to try and reverse pre-diabetes or an early rise in blood sugar. The studies have been mixed as to whether or not chromium actually helps weight loss. As a result, we need to break it down a little bit further. Does chromium actually help you lose weight? The answer is maybe, and it really depends on why you are overweight, to begin with. From a theoretical standpoint, it makes sense that chromium would help with weight loss because it's involved in the breakdown of macromolecules with as protein, carbohydrates, and fats. Aside from its effects on macromolecule metabolism chromium has also been shown to help reduce appetite or cause appetite suppression. So from this standpoint, it makes sense that by improving the amount of fat that your body burns and by reducing the amount of food that you consume, it should lead to weight loss. It makes sense but it doesn't work for everyone. Part of this reason may have to do with the underlying cause of obesity which isn't always just a problem of eating too much and exercising too little. For instance, it is well known that insulin resistance leads to increased fat deposition through the effects of insulin on fat tissue. So if you have fat which is the result of insulin resistance then chromium is probably going to be more effective for weight loss in YOUR body. But it will likely have less of an effect if you are already eating healthy. 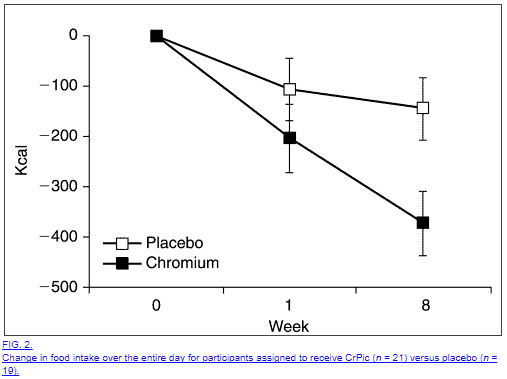 One study showed that taking Chromium Picolinate daily for 24 weeks did result in about 1kg of body weight (8) when compared to placebo in study participants. 1 kg of body weight is about 2.2 pounds (when converted) so the weight loss seen wasn't tremendous (especially compared to other therapies). The good news is that this therapy (chromium) is quite safe and can be added to existing weight loss therapies. Other studies have shown that chromium supplementation (9) does not result in noticeable weight loss when compared to placebo. This study went on for 12 weeks in which participants took 1000mcg of Chromium daily. At the conclusion of this particular study, there were no meaningful changes to BMI or central adiposity compared to placebo. The discrepancy between the studies may have to do with several factors so it doesn't necessarily mean you should rule out Chromium as not being effective for you personally. First is that Chromium is likely more effective for individuals with known insulin resistance, in addition, chromium is likely a better weight loss tool for those who struggle with overeating. Lastly, it's also worth pointing out that weight may not be the right "endpoint" to study when using chromium because using Chromium may result in increased muscle mass and increased fat loss which may not result in a change in weight but would definitely result in increased fat loss. Other supplements work this way such as fish oil (supplements and therapies that increase muscle mass while causing fat loss tend to be weight "neutral" but are still helpful). Based on these results it's probably not a great "weight loss" tool but it can certainly be added to a weight loss regimen provided you suspect or know that you are deficient. Chromium supplementation has also been shown to be helpful in the treatment of atypical depression. Patients with this disorder often present with "atypical" symptoms such as intense carbohydrate cravings and alterations in appetite. It has also been suggested that there is a link between depression and insulin resistance which may be mediated through diet. Therefore supplemental chromium would be a great potential therapy for patients with this disorder as it may impact both insulin regulation and appetite regulation. Studies confirm this to be the case and show that chromium supplementation (10) (600 ug per day) can reduce cravings associated with depression and also improve and reduce the symptoms of depression. Another very important benefit to using chromium is that it may have an impact on total food consumption and especially carbohydrate cravings. This benefit is felt to be one of the reasons that chromium may help with weight loss, but I think we need to be careful about appetite and weight loss in general. It is well known that the consumption of refined carbohydrates leads to an increase in cravings for the same food group. This has lead scientists to believe that sugar and carbohydrates may result in dopaminergic activation in the brain which may lead to a positive response system or put another way an addiction. It has been suggested that chromium may have an impact on specific neurotransmitters in the brain which may block this feedback loop and help to regulate appetite. So it's best to think of chromium as an appetite "normalizer" and not an appetite "suppressant". Suppressing your appetite long term may very well lead to metabolic damage and therefore increase the likelihood of weight gain. An appetite normalizer may help to simply reduce cravings for foods that you shouldn't be eating anyway. Regardless of how chromium works (we don't know exactly) it seems to have a positive effect on people (especially women) who have intense carbohydrate cravings. Chromium supplementation has also shown some early promise in the treatment of binge eating disorders (12) where it may have effects on serotonin and dopamine pathways. Chromium probably shouldn't be used as monotherapy for these conditions but it may be considered as an additive therapy or adjunct therapy to existing treatments. As an essential trace mineral, you want to have enough chromium in your body without getting too much. In this way, it is very much a "Goldilocks" nutrient (like iron). You can prevent the risk of taking too much by limiting the amount that you take and the duration that you take it! In most cases, it's best to use chromium only until your problem has either improved or resolved completely. With this in mind, the average dose of chromium picolinate tends to be around 200-1,000mcg per day. Dosing depends on what you are treating (as does duration). Use the guide below to help determine how you should be using chromium. Chromium picolinate supplementation is generally very safe with few patients experiencing negative side effects. Many studies show that there is an equal amount of side effects in both placebo and non-placebo arms, indicating that chromium is likely very safe and well tolerated. You can further reduce the risk of negative side effects by using chromium picolinate for short periods of time (months). This may reduce the risk of developing cellular damage from oxidative stress. In most cases, these side effects are self-limiting (meaning they tend to resolve with time), but if you experience them it may be an early indication that you are either taking too much chromium or it may not be the right supplement for you. As always make sure to consult with your physician especially if you are using other medications that may alter blood sugar levels! Chromium picolinate is a very safe and effective mineral that may make a difference in symptoms ranging from weight gain to insulin resistance and even appetite suppression. Chromium bound to picolinic acid results in improved absorption and bioavailability even when compared to natural food sources of chromium. Even though chromium picolinate is highly absorbed it may cause cellular damage if used in excessive doses and for excessive periods of time. You can prevent these side effects by only using it when necessary and for the appropriate amount of time. Have you tried supplementing with chromium before? Did it help with appetite or with weight loss or with any of your symptoms?